Hi friends! Join us for an exciting and fun times running a 3D printer booth at a popular upscale mall; close to a mall Santa himself. Skip the fluff. Jump straight into the short (3 min) contact form if you’re interested and we’ll get in touch soon. 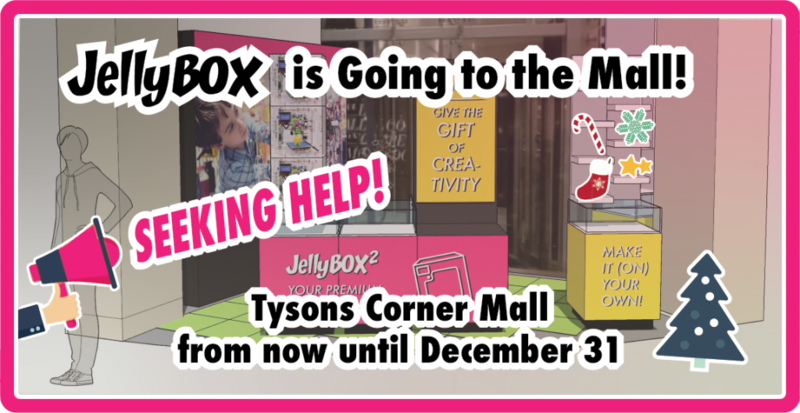 To increase Christmas sales and visibility, we will have a booth at the Tysons Corner Mall (Northern VA) for 5 weeks starting November 23rd (Black Friday) and ending December 31st. We are looking for help supervising the booth, talking to potential customers and watching all the JellyBOXes. You can put in as little as 4 hours a day, any time of the day, anytime between now and the end of December. (You can also stop by just to hang out with no time requirements ). Fill out this short (3 min) contact form if you’re interested and we’ll get in touch soon. If you are a friend and want to come and hang out with us, that’s GREAT are we are psyched to have you! In addition, we also need people to run the booth when we are not there. We can’t be there 24/7. Straight up hourly pay is also available. Great! Please fill this contact form and we’ll get in touch SOON. We can email you infrequent and irregular updates on new Crash Courses scheduled, major design developments, and the like. Congrats! You have subscribed. Expect a confirmation email from us. We make 3D printer builds and 3D printers specifically designed for education.